This handsome tuxedo cat is one of the “Revolutionary Kittens”. Jefferson was trapped along with his brothers Washington and Hamilton in Garden City. All three boys were born on 10/25/18. They’ve been lovingly fostered and are now ready for their very own families and forever homes. 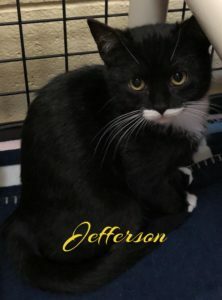 Come meet Jefferson and let him start a revolution of love and happiness in your life! This entry was posted in Adopted, Adopted Cats, Cats, Male, Under 6 Months, Wantagh Adoption Center. Bookmark the permalink.